and also used it for dipping homemade naan - it was awesome! Lemon Asparagus Linguine - Amazing!! Soooo effing good, seriously! I followed the recipes pretty closely, just adding a little less oil and maybe a bit more lemon juice....I think I'd really like this with penne pasta too - I'll try that next time. 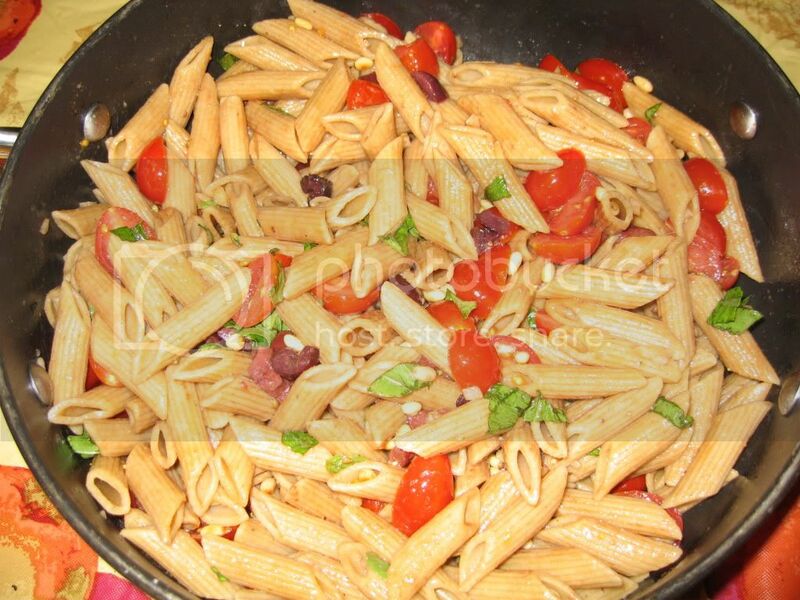 Tomato, Basil, and Roasted Pine Nut Penne - YUMMY! Definitely a favorite! Black Bean, Dried Apricot & Cilantro Salad - very good! 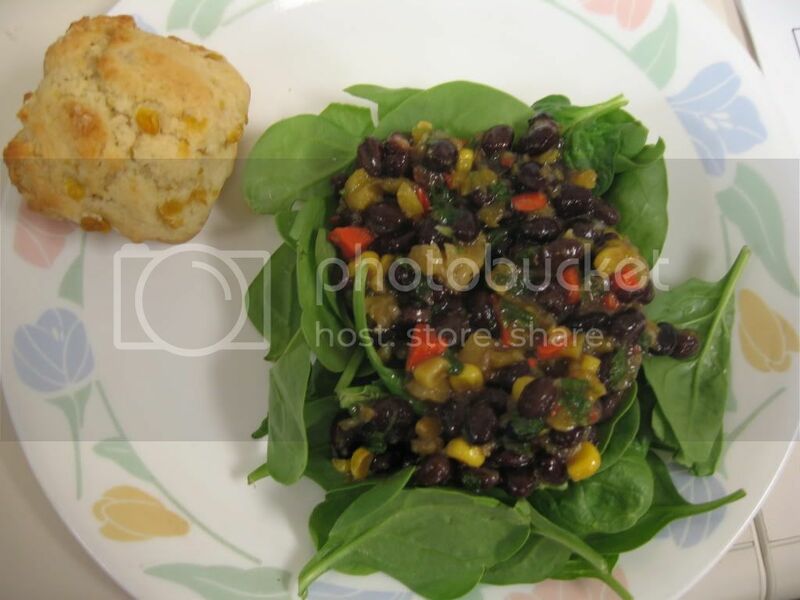 I could really taste the ginger and that took some getting used to, but I loved it with fresh organic baby spinach leaves, it was very filling and delicious, I loved that I didn't have to heat anything up; very easy to make and so colorful! Thanks for the review above. It made me decide to try it. 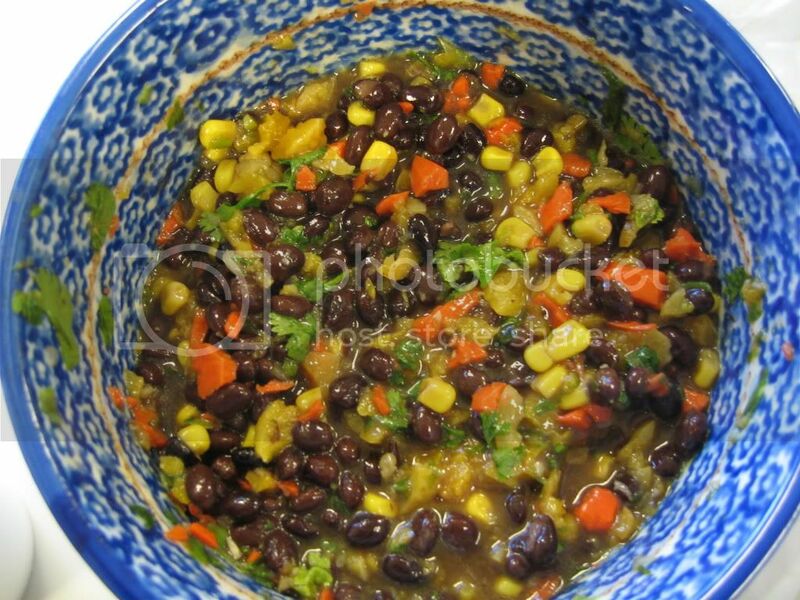 Black bean, cilantro, and apricot salad - OMG I so loved this! Fantastic! I followed her emphatic advice to marinate it for several hours and I agree that is a crucial step because it tasted much better many hours later. The mixture of all the various ingredients like appricots, cilantro, mango juice, lime, soy sauce and ginger is brilliant. I omitted the salt. I used some lettuce I got from the CSA rather than spinach and served the beans on top. I made a few changes, but this was pretty good. I reduced the sugar and balsamic vinegar to a little less than 1 tbsp and added a chopped green pepper. I also added some cumin and a little celery salt. My chili powder is flavorful, but not very spicy, so I added a little cayenne. I used crumbled tempeh with a mixture of dried black beans and pintos, and there were probably more than 2 cans. Black bean, cilantro, and apricot salad - YUM! The dressing is phenomenal! I cooked my own black beans, used mango nectar (instead of juice), lemon juice (instead of lime - lime would be even better) and increased the carrots because I omitted the corn, but otherwise followed the recipe. Delicious! I love the mix of crunchy from the carrots, soft from the beans, silky from the spinach and delicious sweet and fruity dressing. Fat free red lentils and spinach with tamarind - After knocking over my chutney, I only had a smidgen over 1/3 cup, so I had enough to make a 2-person serving of this red lentil dish. It was incredibly easy to make once I had the chutney, and the chutney brought an immense amount of flavour to the dish. I really enjoyed this! - These are really flavorful beans. I liked the addition of the pineapple with its burst of sweetness. My onions were really caramelized which worked out well, too. My only suggestion for next time is to double the pineapple - this dish could take it. Plus, half a pineapple was 2 cups, so this way I could use the whole pineapple for the one dish. :) A tasty twist for black beans, though. Thai tofu and tropical fruit salad - A very tasty main-course salad. I liked the addition of the lime-tamari tofu with the multitude of tropical fruit. As suggested, I halved the dressing and found it worked well because I am not a dressing-heavy person. I omitted the mint completely and just used cilantro. She says serves 2 as a main course, but I got more like 3-4 main course portions. Yum! Mulligatawny My first bust of a recipe.. I didn't like it, but my guests did (one even asked for the recipe), so there is still hope! I don't know what mullitgawtny soup is supposed to taste like, but this was basically a coconut-based cilantro and lemon soup. I did not use asafoetida, though, as I have heard it is very pungent. Instead I used a homemade mixture akin to garam masala (3/4 tsp cumin, 3/4 tsp cardamom, 1/4 tsp cloves, 1/2 tsp coriander, 1/2 tsp cinnamon, 1/4 tsp nutmeg, 1/2 tsp chili flakes and 1 bay leaf). It was a subtle soup, very lemony, to boot. The coconut milk definitely tames the heat, so add more spice if you want it spicy.. and I would likely decrease the lemon juice next time. This is an excellent dip! Creamy, smooth, salty with a bit of zip. It is hard to place the flavours exactly, but I know it tastes great. I served it with veggies and bread (didn't have any sesame crackers). I really liked this soup. I just used the juice from one lemon, so it wasn't particularly lemony, but the soy milk made it very creamy with the red lentils. The spinach added nice bulk. Tasty! Indian spiced supergrain cereal - I adapted this slightly, to include 1 tbsp chia seeds with an extra 1/4 cup water. Used both raisins and currants and used 1/2 tbsp agave nectar instead of the maple syrup. I liked it. It wasn't smooth like my typical steel-cut oatmeal, rather a bit crunchy (perhaps it needed more than 15 minutes to be cooked?). But I liked it as something different. The flavours worked well together. I may increase the spices next time. (This recipe is also in TWWS). I really liked this. Light, tasty and healthy. A starter salad, though. I used 2 large navel oranges to feed 4 people and sectioned them to remove all the pith. I marinaded the red onion in the dressing for at least 20 minutes prior to plating (a tip I've picked up from America's test Kitchens for people like me that are scared of spicy raw onions). Delicious with the light balsamic and toasted almonds. I subbed agave nectar for the maple syrup without problems. I really liked this salad! My typical flavour combo is almond-lemon-cranberry, so I pushed my boundaries when I listened to Tess to use walnut-orange-cranberry. Delicious! I never would have thought to combine it with shiitakes, either. To make this a main course salad, I plated the baby spinach first, then topped with cooked adzuki beans. I panfried 3 cups of sliced shiitakes caps and added that to the marinade with the onions. I added that on top of the beans, then I sprinkled the entire salad with the walnuts and dried cranberries. Lovely! Divine mango pie - I really liked this. I made half the recipe and split it into 3 ramekins. The crust was a bit crumbly, and worked really well in the ramekins, otherwise I think it would have been hard to serve like an actual pie. The dried mango infused such a pervasive mango flavour, it was awesome. I also happened to use Alphonso mangoes which are to-die-for. :) Topped with blackberries. Lovely, healthy dessert! Blackberry peach cobbler - I really liked this. It is more of a crisp than a cobbler, though. The proportions are WAY off, though. I made half of the topping (with almonds instead of walnuts) to serve 4. Used around 6-7 cups of fresh fruit for that amount of topping (I used blackberries and raspberries, but next time I will try it with mango), but actually just made the topping and topped the fruit fresh each morning. I thought it was going to be ooky sweet with the additional sugar, but thought it was fine. It all depends how sweet your fruit is. Apple cinnamon flapjacks - these turned out pretty good. i always like the apple-cinnamon combo. I typically use white whole wheat flour or whole wheat pastry flour along with some oats for pancakes/waffles, and these came out much heavier and "healthy" tasting with the multigrain mix. they were extremely filling. Magical multigrain pancake mix - we thought this was just okay.. rather than "crunchy," my husband described the texture as "gritty". Easy and addictive eggplant chips - yes, these are delicious! Very simple to make. I love eggplant and typically use it in italian style dishes. I liked how this came out tasting very asian inspired dish thanks to the soy sauce. I will make these again for sure. Oven roasted cauliflower with rosemary and garlic - I was surprised just how great this was. Best cauliflower dish I've had. Baby greens with arugula, apples, and caramelized pecans - one of my favorite salads! this is a great way to kick off dinner. I've made it several times, but haven't bothered with the arugula. The maple-pecans and apples are delicious. My husband and I both love the dressing (I use strawberry jam cause he's crazy for strawberries) which tastes kind of like a syrup. I am impressed with how easy the dressing is to make, and I make it frequently to just put over baby greens when I don't feel like making the entire salad after work. Creamy adzuki beans - This was very very good. I was expecting it to be absolutely amazing, which it wasn't (it just seemed to be missing something)… but it's still a great dish and something I will make again. I soaked my adzuki beans over night and they took 45 mins or so to cook. Deluxe almond veggie burgers - we didn't like this much. It's a very heavy burger with all the nuts and grains, so it is a bit too much to eat these with bread. The flavor was also a little lacking, and the pinto beans (one of my faves) didn't shine through in the final product. Not bad, but definitely not something I would make again. Low fat basil garlic linguine - a simple and very good dish. i used whole wheat linguine and it came out perfect. i like this as an easy dinner after a long day at work. Tomato, basil, and roasted pine nut penne - this is a wonderful and easy dish that i've made several times. works great with whole wheat penne. there's no nutrition info, but the (healthy) ingredients seems pretty fattening, which is unfortunate because otherwise I would make it all the time. I agree that this is ideal to make for company.